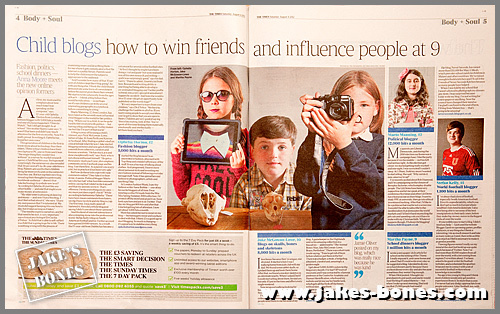 You are here: Jake's Bones > I'm in The Times today (with a video) ! This weekend is a special weekend because I'm in The Times Weekend supplement today ! Today I'm going to write about what it was like to be photographed (together with a video of it !) and tomorrow morning I'm going to write about another post my advice to other kids that want to start blogging. Martha Payne is probably the most famous child blogger there and she deserves to be because she has done amazing things. She is 9 and hasn't been blogging long but she blogs on Never Seconds about her school dinners and she managed to raise over £110,000 for the Mary's Meals charity, which is pretty amazing. Here it is. libdemchild is Maeleo Manning's blog who is 12 and she writes about the Liberal Democrats who are the third biggest political party in the UK. Here it is. Who's That Girl ? 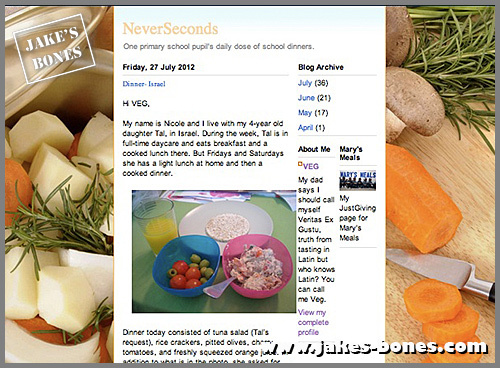 is Ophelia Horton's blog and she is 12. She blogs about fashion and photographs her own fashion shoots. Here it is. 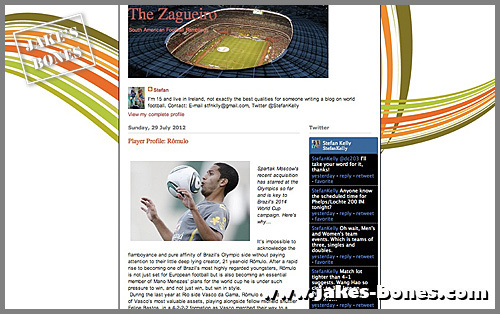 The Zagueiro is Stefan Kelly's blog and it's about South American football. He is 15 and from Ireland. Here is his blog. This isn't the first time I have been in the newspapers or TV, though. You can read about the other times on my "About" page. The article was very good, but there were some mistakes. Website "hits" aren't the same as "visitors" (I get 5,000-8,000 visitors a month, but my hits are way more), and the mystery tin of bones was sent after I was in the newspaper for finding the WWII bomb, not really because of my blog. I think I look a bit boring in the picture and I'm not boring in real life, though. It's still a nice article to read. I'm going to post tomorrow about my tips on blogging if you're a kid. If you like my blog and would like to be reminded when I post, you can be a fan of the website on Facebook, follow me on Twitter, or get an email when I post new articles (see the icons at the top of the page) ! 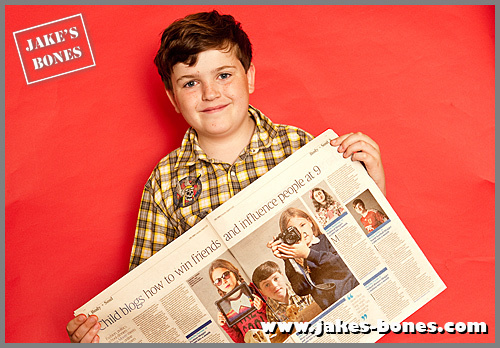 Well done, Jake ! Mum and I are really proud of you. You must be so excited his morning. I enjoyed reading the article and you remind me of my 10 year old self; I was into owls, especially barn owls and collected feathers, eggs (old ones of course) and dissected their pellets to find vole skeletons. Looks like your in the limelight...again! Thanks Jake for mentioning me. Well done for being in the Times. All the best Maelo Manning.